Last year I raved about the debut of Orange is the New Black on Netflix, and this year I am happy to say the highly anticipated second season does not disappoint. Unlike my first review of the show, for this season I would like to get a little deeper into the new characters and how they affect the show’s plot and character development, which by this time has had a bit more room to grow. 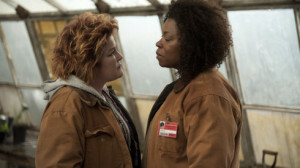 Where S1 of OITNB was largely about introductions, getting the audience familiar with Chapman and her new prison home, this season is mainly about stark changes and parallels. We are introduced to two new inmates, Brook Soso (Kimiko Glenn, in her first recurring role in a television series) and Yvonne “Vee” Parker (Lorraine Toussant) who both mirror other familiar faces, namely Piper and Red. 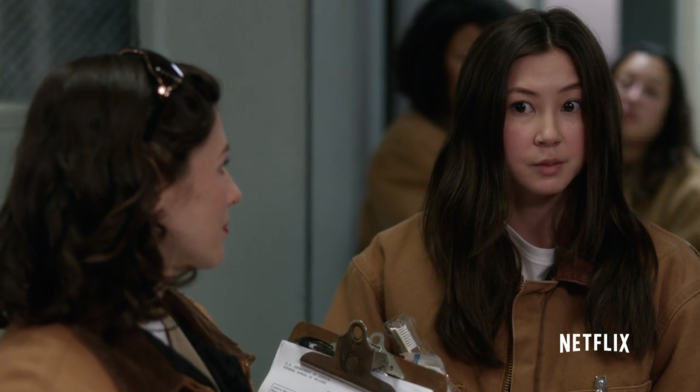 The comparisons between Piper and Brook are easy enough, especially when Soso first arrives and annoys everyone with endless chatter about her various volunteering experiences, the protests she staged, and the books she has read. She is the new girl trying to make the best of a bad experience and maintain her sense of self, but with the constant badgering she receives from other inmates, her peppy spirit gradually deteriorates. She ultimately admits to Piper that she doesn’t think she will be the same person when she gets out, and for her, that is not acceptable. In Soso, Piper is able to see a reflection of herself and the way others have viewed her. She seems to be equal parts embarrassed and frustrated by this reflection, and lashes out when Brook attempts to befriend her. While Brook openly craves community and acceptance, Piper continues to emphasize her status as a “lone wolf.” However, Piper’s actions throughout the second season only prove just how dependent she is on other people’s acceptance and love. A few of the other great developments this season include more inmate backstories, told in flashbacks. Some of the most heart-wrenching and compelling are those of Taystee, Poussey, and Rosa. We also finally get more insight into Suzanne’s past, and let me just say, if Uzo Aduba does not win some kind of award for her performance this season, there is no justice in this world, because she is simply amazing to watch. With all the new information we are given about some familiar faces, relationships become more complicated, stakes are raised, and big changes are in store for all of Litchfield. The second season of Orange is the New Black is full of surprises, but what is not surprising is how it continues to treat its characters and their stories with dignity and the weight of reality. The second season is just as endearing, heart-breaking, funny, and intense as the first, and now that Netflix has knocked two seasons out of the park, I have nothing but high hopes for season three in 2015. This entry was posted in television and tagged Orange is the New Black. Bookmark the permalink.